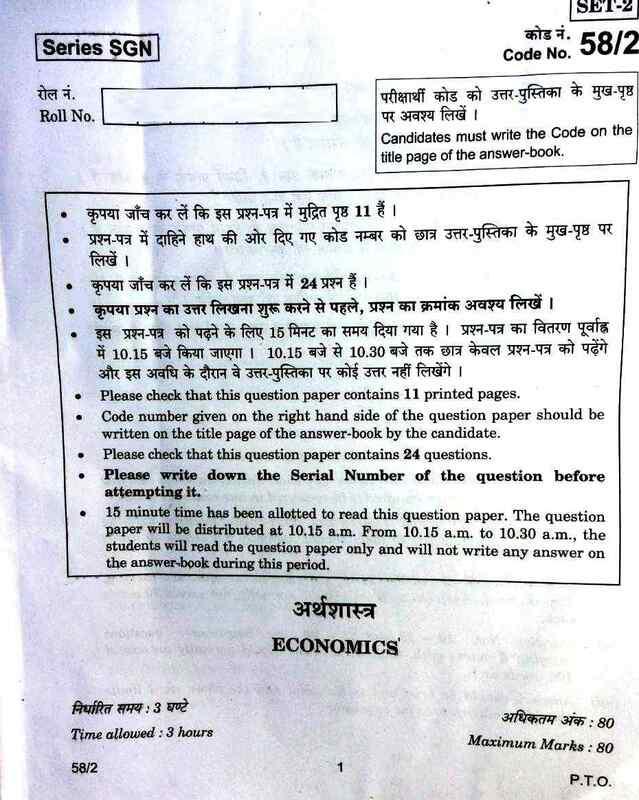 Question paper of CBSE Class 12 Economics board exam 2018 is available here for download in PDF format. You can download the complete question paper with the help of download link given at the end of this article. Question2. State one example of positive economics. Question5. What is meant by inelastic demand ? Compare it with perfectly inelastic demand. Question6. Explain the central problem of "for shorn to produce. Question7. What is meant by price ceiling ? Explain its implications. Question8. Given the price of a good, how will a consumer decide as to how much quantity to buy of that good ? Explain. 'What is Indifference Curve ? State three properties of indifference curves. Question9. When the price of a commodity changes from Rs. 4 per unit to Rs. 15 per unit, its market supply rises from 100 units to 120 units. Calculate the price elasticity of supply. Is supply elastic? Give reason. Question10. Explain the conditions of producer's equilibrium in terms of marginal revenue and marginal cost. Question11. State three characteristics of monopolistic competition. Which of the characteristics separates it from perfect competition and why ? Question12. Explain the conditions of consumer's equilibrium using Indifference Curve Analysis. Question17. Define multiplier. What is the relation between marginal propensity to consume and multiplier ? Calculate the marginal propensity to consume if the value of multiplier is 4. Question18. Which among the following are final goods and which are intermediate goods ? Give reasons. Given nominal income, how can we find real income ? Explain. Question19. The value of marginal propensity to consume is 0.6 and initial income in the economy is Rs 100 crores. Prepare a schedule showing Income, Consumption and Saving. Also show the equilibrium level of income by assuming autonomous investment of Rs 80 crores. Question20. Explain the role of the Reserve Bank of India as the "lender of last resort". Question21. What is meant by inflationary gap ? State three measures to reduce this gap. What is meant by aggregate demand ? State its components. Question24. (a) Explain the impact of rise in exchange rate on national income. (b) Explain the concept of 'deficit' in balance of payments.